Two distinct consumer segments are emerging within the burgeoning U.S. cannabis marketplace: one predominantly using the hemp derivative CBD for medical benefits and others using cannabis mainly for recreational reasons. That’s the finding of new data published by media-planning researcher MRI as part of its recently conducted National Cannabis Study. Fully half of those identifying as CBD users cited medical benefits, while only 15% of all cannabis users asserted the drug’s medical applications. The study estimates that 36 million American adults identify themselves as cannabis consumers, with about 10% (3.7 million) users of CBD products. CBD, or cannabidiol, is one of a variety of cannabinoids produced by cannabis plants, and clinical research has shown that it has health and medical-related benefits for treating anxiety, cognition, movement disorders and pain, among others. The study also segments cannabis users -- both medical and recreational -- in terms of their media consumption patterns and MRI’s analysts have already found some interesting insights. 2 comments about "MRI Data Reveals Two Distinct Cannabis Consumer Segments, Unique Media Patterns Too". 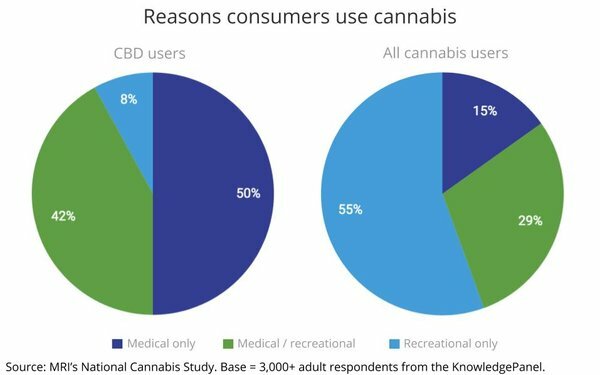 Benny Thomas from Rise&Shine&Partners, April 12, 2019 at 1:51 p.m.
How on earth is the finding that consumption in the category falls into the only 2 sub-categories possible - ie, with THC and without - a finding or an insight? This is the kind of article tht gives research a bad name. I designed and fielded custom research nation-wide, and uncovered deeper insights about the startling lack of knowledge in the category and some other ways in which cannabis trends are at variance with norms or expectations. Coming soon. Joe Mandese from MediaPost, April 12, 2019 at 2:12 p.m.
@Benny Thomas: I don't follow your criticism or why it represents a "startling lack of knowledge." MRI is the gold standard of (syndicated) media planning research, and this particular research was mostly a census for segmenting cannabis consumers into discrete product categories within the market: THC vs. CBD. MRI also has data on how those consumer segments correlate to media usage, which is the way advertisers and agencies would use the insight to create and target campaigns to reach and influence them. They have passed some along to us and we plan to publish it late next week.